This week, we published the HL7 Domain Analysis Model: Clinical Genomics after a rigorous ISO/ANSI-compatible balloting process. The document is part of an ongoing effort by the HL7 Clinical Genomics Work Group to identify common workflows and use cases to facilitate scalable and interoperable data standards for the breadth of clinical genomics scenarios. The Domain Analysis Model (DAM) is becoming a widely used reference for clinical genomics, covering a myriad of use cases, including emerging ones such as preimplantation genetic diagnosis, whole exome sequencing, RNA-sequencing and proteomics. The document presents narrative context and workflow diagrams to guide readers through the stages of each use case and details steps involving the various stakeholders such as patients, health care providers, laboratories and geneticists. This contextual knowledge aids in the development and implementation of software designed to interpret and communicate the relevant results in a clinical computer system, especially a patient's electronic health record (EHR). The HL7 Clinical Genomics Work Group developed several new applications and refinements in the Domain Analysis Model beyond its original scope of clinical sequencing. One notable addition is the analysis of the common workflows for preimplantation genetic diagnosis (PGD). For those undergoing in-vitro fertilization, advanced preimplantation genetic screening has become increasingly popular as it avoids the implantation of embryos carrying chromosomal aneuploidies, a common cause of birth defects. Implementers can follow the workflow diagram and see the context for each transfer of information, including the types of tests performed such as blastocyst biopsy and embryo vitrification. Whole exome sequencing is another significant breakthrough in human genetics. The exome is approximately 1-2% of the human genome and is responsible for protein-coding. Some variations found in the exome can coincide with genetic disorders. However, these tests can create a complex workflow as viewing their results alongside parental sequencing data provides the most insight into a child with a difficult diagnosis. The DAM provides context and guidance for developers and analysts in navigating these tests over their lifecycle. As the clinical utility of proteomics (detecting, quantifying and characterizing proteins) and RNA-sequencing increases, the DAM also outlines clinical and laboratory workflows to capitalize on these emerging technologies. Additional use cases will continue to be explored through valuable feedback and stakeholder input received via the Clinical Genomics Work Group and at other HL7 sponsored events. One such event where comments were received was HL7’s third Annual Genomics Conference, Global Clinical Genomics, Artificial Intelligence and Innovation. As Grant Wood, chair of the genomics conference observed, “We wanted to bring together people involved in patient care delivery, lab testing, data standards, technology investment and development, and from a policy perspective, to look at novel use cases that involve advancing clinical genomics, and what the issues are that we would have to overcome to achieve that.” The conference took place last year in Washington, D.C.
Future challenges arise from uncertainty in the specific storage location, e.g., Genomics Archive and Computer/Communication System (GACS), as well as the structure of a patient’s genomic and other omics data for access on demand, both by clinicians and laboratories. Best practices in handling such considerations are being formulated within HL7 and include international input from across the spectrum of stakeholders. In parallel, the HL7 Clinical Genomics Work Group has been preparing an implementation guide for clinical genomics around many of these use cases, to be leveraged alongside the newly published HL7 FHIR Release 4 standard. 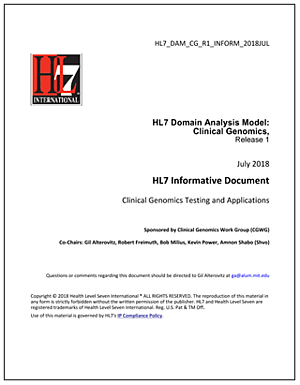 With content from 19 co-authors, the HL7 Domain Analysis Model: Clinical Genomics spans 100 pages and provides dozens of use case diagrams. Several helpful glossaries and appendices are also included for reference.